Hot on the heels of its new Express store in Redcar, which launched last month, the discount variety chain Poundworld is set to open another new store in Cramlington this Friday (6 April). 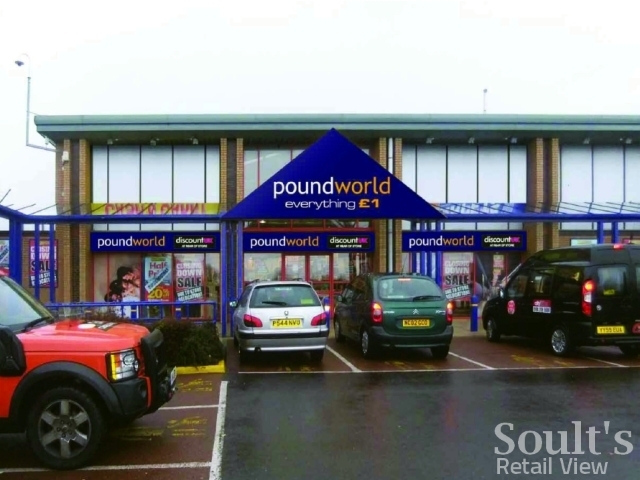 Poundworld already trades from a shop inside the Manor Walks shopping centre, but the new arrival is an additional store that will operate from the nearby Westmorland Retail Park. I’m not especially familiar with Cramlington, but the store’s address – Unit 2 – suggests that it is taking over the retail park’s Storey Carpets premises. Both the mall and retail park at Cramlington – which, typically for a post-war new town, basically are the town centre – have been owned since 2006 by Hammerson, the retail asset management company that acquired Newcastle’s Monument Mall last year. Just as its planned redevelopment of Monument Mall will see major improvements to the lettable retail space, Hammerson has also been proactive in managing Cramlington assets, where M&S Simply Food and a Vue cinema are both set to open in the next 18 months. 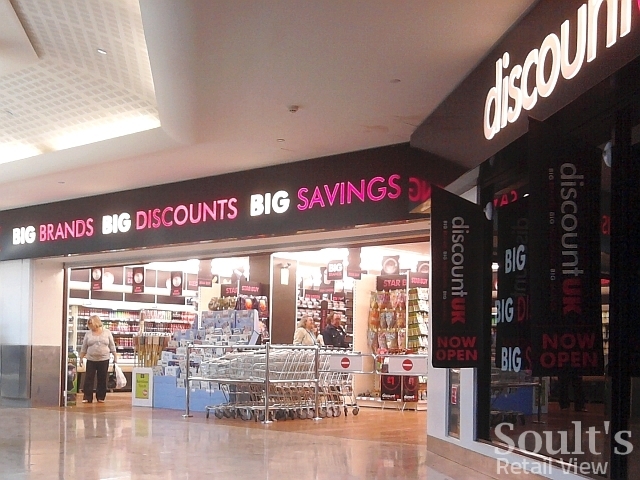 Interestingly, the new 10,000 sq ft Cramlington Poundworld will, like the Swindon store that I blogged about in February, be the fourth dual-fascia store with Discount UK, the group’s multi-price brand that already has standalone branches in both Newcastle’s and Middlesbrough’s former Woolworths units. 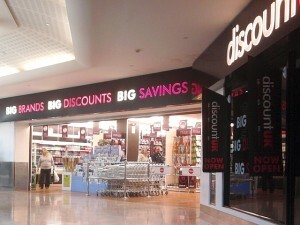 Though the Cramlington store will be slightly smaller than Swindon’s, the split between the two brands – two thirds Poundworld and one third Discount UK – is the same, as is the size of the product range: 5,000 items priced at £1 in Poundworld, and a further 3,000 items priced below or above a pound in the Discount UK portion. I previously queried the effectiveness of the 2-in-1 fascia treatment at Swindon, arguing that the juxtaposition of the two logos was a little clumsy. At Cramlington, it’s interesting that the artist’s impression of the store exterior – featured at the top of this post – shows even greater prominence being given to the Poundworld brand over that of Discount UK. 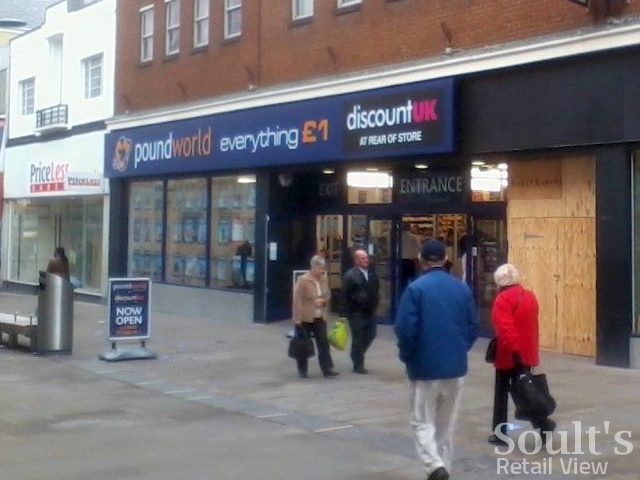 With the Orpington store having just been converted from a standalone Discount UK to a dual fascia, is this a sign that Poundworld is putting the brakes on its Discount UK expansion? Apparently not – Poundworld’s PR people tell me that “there are no plans to phase out Discount UK as a standalone brand, and no plans in the pipeline to convert any other existing Discount UKs into dual fascias.” Still, it will be interesting to keep track of how things progress in the coming months, given that the most recent large-footprint stores to open have all been dual-branded rather than Discount UKs alone. There’s no doubt that the standalone Discount UK stores look much nicer externally – and, indeed, internally – than either Poundworld’s eponymous shops or the new dual-fascia stores. However, in the current straitened times, perhaps we shouldn’t be too surprised that the simple ‘Everything £1’ message retains a resonance among shoppers that Poundworld seems keen to keep capitalising on.